It’s Official- Aerospike is 10x faster than Cassandra and MongoDB! In an independent benchmark test of NoSQL databases conducted by Thumbtack Technology, Aerospike wiped out the competition, delivering nearly 10 times the throughput. The Thumbtack benchmark used Yahoo! Cloud Serving Benchmark (YCSB) to simulate a high-throughput environment, typical of many consumer-facing website applications. 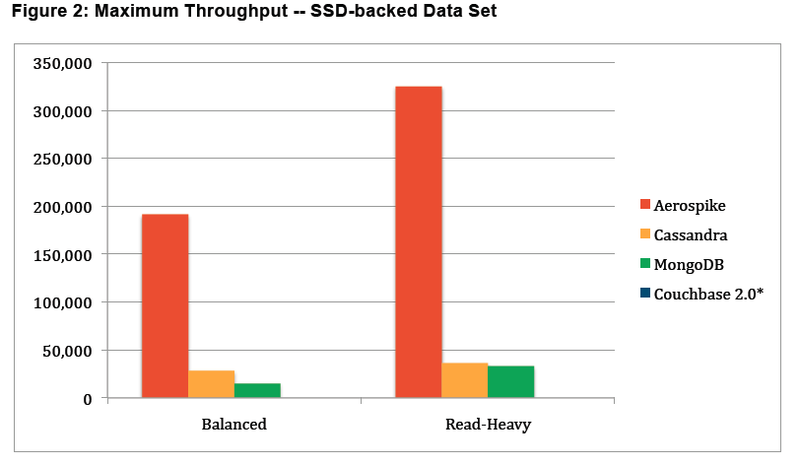 The flash drive/SSD optimizations of Aerospike delivered an unprecedented speed advantage over other databases. As shown in the graph, Aerospike achieved nearly 200,000 transactions per second (TPS) in balanced read-write tests and over 300,000 TPS in read-heavy tests. That’s the equivalent of less than 1 millisecond per transaction, on average. Cassandra and MongoDB delivered less than 30,000 TPS under the same loads and Couchbase failed to complete the test. In early 2014, we doubled our performance on the same YCSB tests. Read the 1 M TPS post.